Chez Pim has a special treat today, and for a couple more days next week. We have another special guest blogger, this time a wine maker from Burgundy who will share some fun –and not so fun- experiences from the harvest this year. Wine is something I am learning, and in my quest I am lucky to have many friends who are ever so generous with their expertise. One of those friends, Claude Kolm, of the Fine Wine Review, let me follow him to Burgundy last year on a tasting trip. It was during that glorious trip to Burgundy that I met the dashing Jeremy Seysses, of the famous Domaine Dujac. Claude and I went to the domaine to taste wine with Jeremy, and were invited to stay for lunch afterwards. I was introduced to his father Jacques Seysses, the founder of the domaine and the one who made it famous, and his wonderful mother Rosalind who is in charge of the domaine's PR. Rosalind is American. She went to Burgundy for an internship, and ended up falling in love with and marrying Jacques Seysses. Jeremy is their eldest son. How romantic is that story? Even sweeter –I'm such a sucker for wonderful love stories- is that Jeremy met his American wife in exactly the same way. His gorgeous wife Diana Snowden –herself from a California wine making family- went to Dujac as an intern, and the rest is family history. That would make Jeremy even more than half American, don't you think? Though young, good looking, and a scion of a great wine making family, Jeremy is hardly a lightweight. He read Biology at Oxford –presided the fabled Oxford Wine Circle while there no less- and has a degree in Science de la Vigne from the University of Burgundy. He is also coming into his own as a capable winemaker, working at the family's property in Provence, Domane de Triennes, and collaborating closely with his father in all major decisions at Domaine Dujac. He's even making wines under his own label, Dujac Fils et Père. Jeremy has generously agreed to share his experience with this year's harvest in Burgundy with us here on Chez Pim. I am very excited about this: what better way to learn to appreciate wine than learning from the ground up? 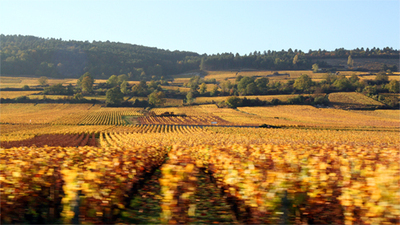 Next time you drink a glass of Burgundy, you can experience through the taste the feel of the vineyards, the effect of the climate, the grapes, the soil, and everything that goes into making that delicious wine in your hand. Happy drinking, and happy reading! Were any of you in Burgundy last winter? It was beautiful, with snow everywhere and it stayed white for a long time. When I say a long time, many here would argue that winter lasted until summer. Spring was a quick affair. A late bud-break and a lot of rain were it's defining features. Following bud-break, there usually follows a tense month during which every grower gets up during the night to check the outdoor temperature and even hardened atheists prey that it will not frost. If frost covers the tender new shoots, the rising sun will scorch them and the crop quality and yield can be seriously compromised. This year's rain had many drawbacks, but it did mean that the risk of frost was non-existent. We did have one big scare in late May, when the temperatures dropped very close to freezing and it actually snowed in the Jura and Vosges mountains on 1st June at altitudes as low as 800m. Freak weather is going to have to be re-defined as it seems to occur more and more regularly. One extreme inevitably leading to another, the weather then moved straight into a beautiful and super warm month of June and an even hotter July. There was mad rush in the vineyards to keep up with the vines' growth. When there is enough water in the soil and the weather is warm and sunny, you can almost see them grow. I have measured shoots growing over 4 inches in a day! At that stage, we have to remove any unwanted shoots and trellis the remaining ones. 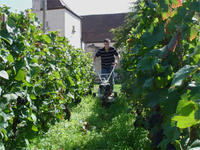 Vines in Burgundy are planted densely, 1 meter by 1 meter. On a medium size estate like ours (about 15.5 hectares or 39 acres), this means we have 155,000 vines to prune, trellis, etc. and that we take care of throughout the years. To summarize things briefly, it has been a summer of extremes, July being very hot and dry, pushing the vines to the limit of water stress. Irrigation is not permitted here and there are times when the roots really have to delve deep into the limestone to find moisture. Towards the end of July, the weather took a dramatic turn. We had a hail storm go through on 27th July. Hail can be truly devastating. This storm was less dramatic but still left plenty of damaged leaves and fruit. However, if this sort of thing is going to happen, the earlier the better. The grapes still hardly had any sugar and so rot did not take hold immediately. Cold and damp weather settled in as our beloved high-pressure anticyclone was on holiday in the Azores. Good weather finally returned a few days ago and we are being promised glorious sunshine and, more importantly, dryness for the days to come. On Monday, I went for a walk around the vineyards to take stock and the miserable month of August was not without its consequences. Some of the berries burst because of the excess water and there is grey rot on a number of bunches. A strange thing is that you might find ten completely healthy bunches and then one which will be completely rotten. Easy to sort out at picking time, but perplexing. Another effect of the regular rains of August is that the ground is covered with weeds. We don't use herbicides and just plough them up during the summer. Typically, the dry weather keeps them low until Fall, when they become highly desirable to prevent erosion. We don't really want to plough, because the tractor may damage grapes as it goes by. So we've taken to mowing. Meanwhile, the rest of our team is busy in the cellar. We are bottling most of our 2005 white wines tomorrow. My wife Diana spent the day racking the wines from barrel into tank, filtering them and preparing them for bottling. Unfortunately, I completely failed to take an action shot so that you might see what's involved. I will do better during the picking. 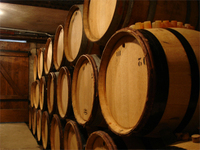 We will be reusing most of the freshly emptied barrels for the 2006 wines, adding a small percentage of new barrels and removing some of the oldest ones. Here's a picture of the barrels we just racked and rinsed as they dry.